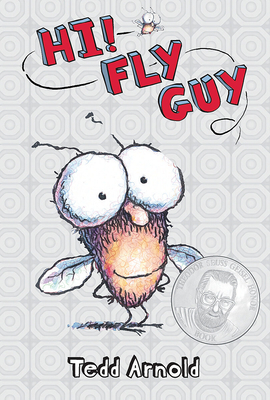 From bestselling author/illustrator Tedd Arnold, creator of PARTS and GREEN WILMA, comes the hilarious FLY GUY! It's easy to read and it comes with a shiny foil cover! "A fly was flying. He was looking for something to eat. Something tasty. Something slimy. A boy was walking. He was looking for something to catch. Something smart. Something for The Amazing Pet Show." The boy and fly meet and so begins a beautiful friendship. Er, and so begins a very funny friendship. Using hyperbole, puns, slapstick, and silly drawings, bestselling author/illustrator Tedd Arnold creates an easy reader that is full of fun. With an eye-catching holographic cover. This is the first in a series of four. SLJ ARNOLD, Tedd. Hi! Fly Guy! illus. by author. 30p. CIP. Scholastic/Cartwheel. 2005. Tr $5.99. ISBN 0-439-63903-4. LC 2004020553.